CHISEL Housing Association helped to facilitate the formation of a housing co-operative, and supported the establishment of the project. The co-operative members were actively involved in selecting architects and the designs of the project. They had to contribute a certain number of hours to the construction of the project every week, alongside formal employment or other duties, as a condition of the affordable housing grant. The original residents organised the construction work and physically built their own homes, learning a great deal through the process. The site off Drakefell Road in Brockley was originally owned by the Council, but had not been used for council housing by the 1990s. As a relatively small site it was available for development. Car parking is provided in one part of site, leaving the rest of the site available to group houses around a shared garden space in the middle of the site. Access to individual homes increases the chance of bumping into neighbours and building a strong sense of community. The houses were designed in close consultation with the group and individuals. Variations to the basic layout were easily achievable as the wall elements are independent of the structural frame. The simple timber frame method was pioneered by architect Walter Segal on self-build schemes in the early 1980s, and since developed and updated to meet construction standards. It is particularly suitable for people without previous building experience as it is makes economical use of ‘off the shelf’ materials, detailed to require as little cutting as possible, while keeping the construction process largely ‘on-site’. The structure uses small pad foundations at the foot of each post. This allows development close to mature trees without expensive retaining structures. The houses incorporate energy saving features and environmentally-healthy specifications. The process from community campaign into community developer shows what residents can achieve. A flexible organisational structure has allowed accountability to members and successful self-managed social housing delivery. Coin Street Community Builders (CSCB) grew out of campaigns against commercial development in the area in the late 70s, which had led to the loss of residents and closure of schools, shops, and open spaces. 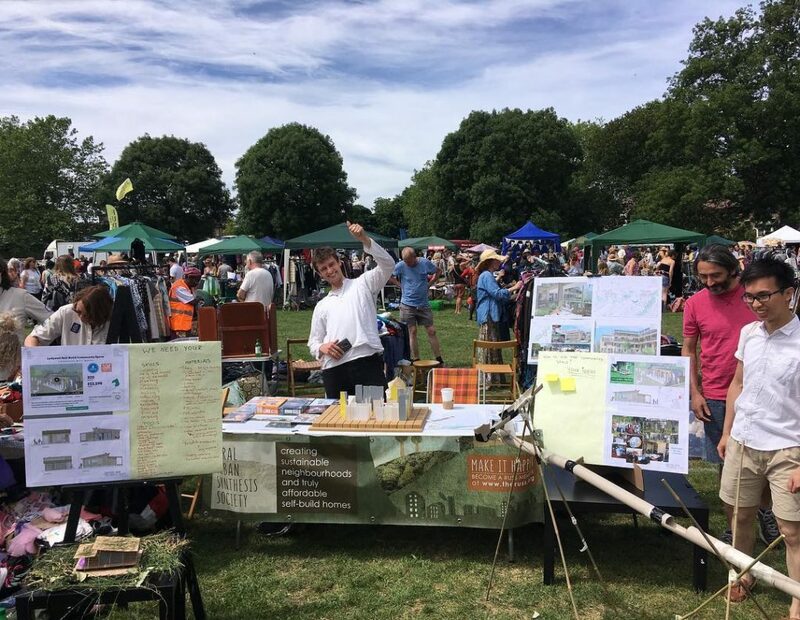 The remaining residents organised themselves to carry out a lengthy campaign for an alternative planning strategy based around affordable housing and open space. Only local people could be members of CSCB and select the board of directors. The board are mainly local residents, with others brought in for specialist skills. The campaign worked with borough councils and the Greater London Council (GLC) to put in place planning policy for the area which limited the value of the land from £4m to £1m. Before its abolition the GLC acquired the land from the developers and local authorities and sold it on to Coin Street Community Builders (CSCB), a non-profit company set up to purchase the land and take the development forward. The GLC had funded the initiative to undertake feasibility studies and development work, which was eventually turned into a loan and repaid once the land was purchased. CSCB borrowed money to finance the £1m site purchase including from the GLC and the Greater London Enterprise Board, as well as private lenders. They used Housing Corporation grants towards the costs of developing the social housing. 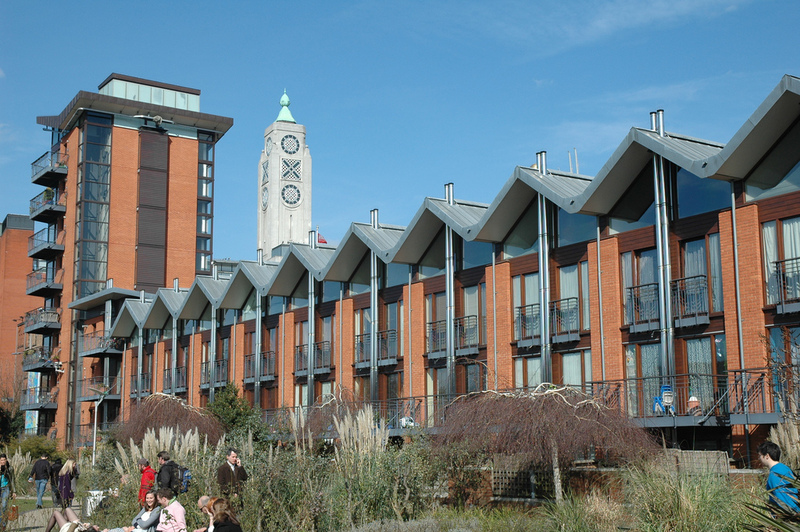 They have also raised funding from commercial endeavours, such as the refurbishment of the Oxo Tower, to invest money back into the area. In the initial phases the group raised revenue through temporary uses to start to pay back their loans and create surpluses for their development schemes. The Coin Street Secondary Housing Cooperative, a Registered Provider of social housing, developed family accommodation for around 1,000 people. The developments are leased to four independent fully mutual housing co-ops, where only residents are members. The Mulberry Housing Co-op was the first housing scheme to be completed in 1998. In the same year a temporary market at Gabriel’s Wharf opened up a public space along the riverside and brought small businesses to the neighbourhood. Iroko Housing Co-op was opened in 2002 designed by Haworth Tompkins Architects to very high standards and energy saving elements made possible through CSCB’s economic independence. The neighbourhood centre offering a mix of local facilities and services, childcare and income generating conference spaces was opened in 2007. The co-operatives foster a collective commitment to the homes. The management is the responsibility of the co-operatives, who can respond quickly to the needs of people living there. New tenants are not expected to have previous knowledge of housing management but can take part in decision making for their communities and help manage the properties. New tenants are required to complete training which gives them a sense of responsibility and the skills required for this stewardship role. Mace Housing Co-op is a fully mutual cooperative with the objective to provide housing for single people and homeless families. Mace manages around 300 properties, leased from housing associations and private owners across eight London boroughs. They employ a number of full time staff and aim to secure leases of at least three years from property owners. Mace received funding from the Empty Homes Community Grant in 2012 to bring vacant properties in Hackney and Camden back into use. The cooperative also received funding from the local authority and developed a total of 44 units on leases of 10 years. The grant total of £1.25 million was match funded with £800k of private sector funding. In early 2017, Camden Council awarded Mace a grant from the first round of the Community Housing Fund. They were able to use this to refurbish flats, which they secured on leases of ten years from a private owner, and to re-house three families nominated by the local authority. The Co-op believes that its members and the communities it serves, should be empowered through practical skills training and launched its SEAP (Skills Empowerment and Advisory Project) Programme last year. The programme is designed specifically for the unemployed and others that are interested in pursuing a career in operational areas of Housing Management. Initiated by the local community, 11 new homes will be built on a garage site in Sydenham and existing residents will be involved in the process. The homes will be genuinely affordable and protected in perpetuity. Lewisham Citizens, part of the Citizens UK charity, held an assembly with 400 people before the local elections in 2014 and persuaded the then Mayor of Lewisham, Sir Steve Bullock, to work with local people to deliver Community Land Trust homes in the borough. After extensive community site walks and a local membership drive, Lewisham Citizens brought in London CLT to discuss specific potential sites with the Council. They also engaged with residents and neighbours, and gradually built up a Residents Steering Committee to help with the plans. Having considered a report to Mayor and Cabinet in 2016, the council agreed that a small area to the rear of the Brasted Close estate should be declared surplus to the Council’s requirements and that officers work with London CLT for a period of twelve months to develop a fully affordable housing scheme for the site. Out of the 17 garages on the site, only 4 were let to residents of the estate. The Council wrote to all garage tenants advising them of the proposal and informing them of other garage locations. Given the proximity of the site to secure tenants, the council also carried out a statutory S105 consultation about the potential sale of the site to build new homes. In addition to the statutory consultation, officers also wrote to leaseholders on the estate. There was only one respondent expressed concern which the designs seek to address. Community Land Trusts (CLTs) are a way of providing genuinely and permanently affordable new homes either for rent or low-cost ownership. They can be used to address the growing gap between people who qualify for social housing and people who can afford to buy their own home. The CLT homes at Brasted Close will be for sale, priced according to local earnings, ensuring that local people are able to live in the local area. ‘Local earnings’ are taken as the average of median incomes using data published by the Office for National Statistics. Based on 2016 figures, the estimated price of a CLT home is around 40-50% of the full market value in the area. Although the scheme is receiving some grant funding from the GLA, these values are primarily achieved because the land value is effectively locked in to the trust in perpetuity through resale price covenants in individual leases, and governance mechanisms to ensure these are not varied. Lewisham Citizens held open meetings in late summer 2016 to discuss aspirations and fears about the scheme and to set the criteria for selecting architects. Several architects presented to residents at a ‘pick the architect’ event in September 2016. Residents chose Archio as their preferred architects. 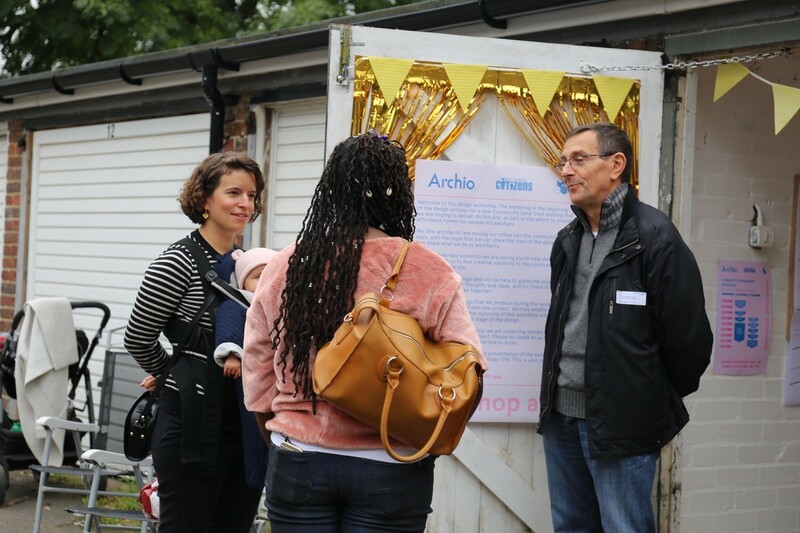 Archio spoke to residents on site to begin the design process. Approximately 30 residents and 48 students and staff from the neighbouring school attended. The community engagement has allowed Archio to develop a scheme addressing the key concerns raised by residents around pedestrian access, overlooking, height, privacy and parking. Planning permission for Brasted Close was granted in April 2019.